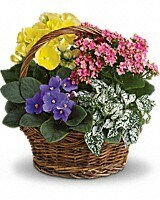 Sing a song of spring by sending this gorgeous basket full of spring's or summers Fall or winter Plants. Send someone special this sweet mix of bright colors and terrific textures.Plant may very depending on time of year. Always up lifting. this can also be upgraded to larger basket for 69.95.